Take the classic Bloody Mary recipe but give it a unique twist (or kick!) using Pomora chili olive oil instead. This is the ideal drink to liven up any festive party, especially when served in shot glasses! Start by measuring out the required amount of vodka - we did 250ml but it depends on your taste! - and pouring into a large jug. Pour the tomato juice (750ml in our case) into the large jug and stir with the vodka. Now for the kick! Instead of using Tabasco sauce, stir in 100ml of Pomora extra virgin chili olive oil for that special spiciness! Add around 20 dashes of Worcestershire sauce and grind in some salt and black pepper to taste. Should you need to cool things down, squeeze in the juice of 1 fresh lemon and mix together. Chop the celery strips into 3 inch pieces and slice the other lemon into small triangles. 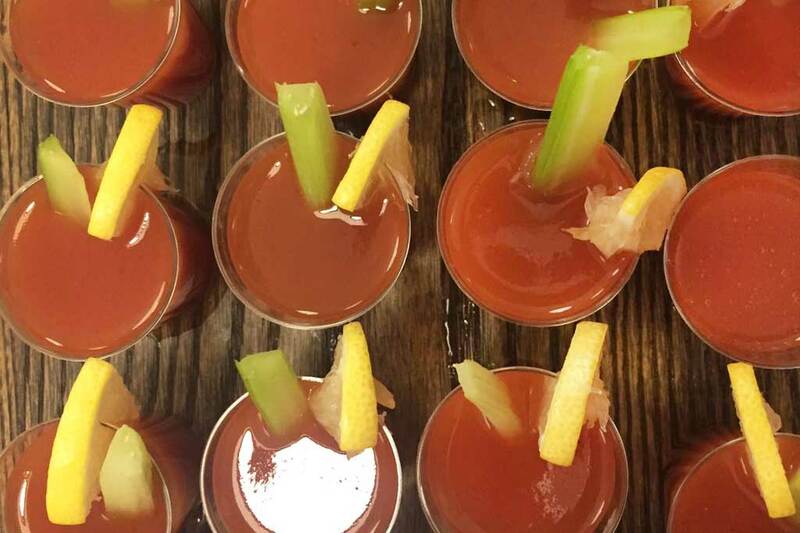 From the large jug, pour the Pomora Bloody Mary into shot glasses and into each add one piece of celery and lemon. Perfect for any dinner party! The kick from the chili olive oil is perfect to blow the cobwebs away!